Now a well-established wine region with several popular wineries and cellar doors, Currency Creek's earliest claim to fame was that it was once proposed as the site for the South Australian capital. The Lions Park provides a good, serviced picnic spot beside a spring-fed stream, with one of South Australia's tallest rail viaducts just a short walk up the valley. Watch out for the Aboriginal canoe trees in the area and try to allow time to walk through the nearby Black Swamp, a heritage-listed wetland with rare bird species. Currency Creek is home to the Currency Creek Eucalyptus Arboretum - the only place in the world where you can see over 90% of Australia's eucalypt species in one place (more than 8,000 trees across 32 hectares). See what people are posting about Currency Creek. 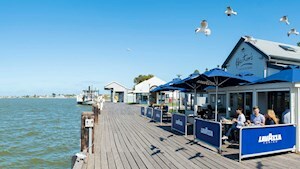 Australia's first Cittaslow Town, Goolwa was once a thriving river port – the last on the Murray River before it reached the Southern Ocean. There are four distinct wine regions including the Southern Fleurieu near Victor Harbor. The history of the Fleurieu Peninsula goes back many, many thousands of years before European arrival and is documented in the rich oral traditions continuing with the Kaurna, Peramangk and Ngarrindjeri.